A special CD-Rom to help teach the Cornish language is to be used at the first secondary school in the country to teach the language. Pupils at Hayle Community School in Cornwall have started using the "Learn Cornish" software, which is also helping staff get to grips with the language too. Cornish is a member of the Celtic family of languages which includes Welsh and Breton. The language was recently granted official status under the European Charter for Regional and Minority Languages. The Cornish Language Fellowship estimates there are around 400 fluent Cornish speakers in the county. Several thousand more people are speakers of conversational Cornish. Dr Jon Mills, a research fellow at the Institute of Cornish Studies, said: "The number of speakers of Cornish has been steadily increasing throughout the 20th Century and continues to increase now." 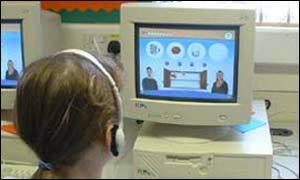 In Hayle, the CD-Rom has been put to good use by a teacher at the school so she could learn more about the language herself. Hayle headteacher Christine Jackman said: "Finding a Cornish language teacher is difficult. "So, this year our own teacher learned it herself so she could teach the children." Richard Howeson, chairman of the language learning company Eurotalk, said the new product would go on sale to "absolute beginners" across the county. He said: "Having seen how passionate about the language people are down here, I would expect it to be used all over the place. "But it will be driven by the children."